A few random thoughts today and hope for the future. Waiting for an afternoon meeting a couple of things occurred to me. One, it’s very difficult to type on the keypad whilst wearing cufflinks. I suppose that when cufflinks were very popular the “wrist rest” wasn’t a part of any sort of typing device or men simply didn’t type. Sleeve openings/cuffs on an off-the-peg suit are always too wide and belt loops drive me to distraction. In the quest for elegance, I fought my natural instinct to wear a brighter mint green and purple tie in favour of this one, which was a groomsman’s gift from a dear friend. It will be in the mid-90º’s when I take my daughter to the photo shoot. I hope I don’t soak through the tie. The English are known for wearing more colourful shirts (in certain circles) and sober ties. The reasons are simple. At one point, a man would only wear his school, regimental or club tie; in short only those organizational ties to which he was organizationally tied. That left precious room for self-expression. It is an older practice that isn’t too bad an idea. And there are plenty of new bad ideas out there if a quick scan of the women’s fashion magazines is any indication. Fortunately, the continued popularity of AMC’s “Mad Men” and a yearning for more stable and prosperous times has many designers looking backward. I’ve written before that the best “fashion” magazine for women is “Q: Quintessential Style”, that magazine that interprets classic style using current runway looks. I hope that they don’t go belly up as so many shelter magazines have in recent months. Classic style means different things to different people. For those who weren’t really sartorially aware in the 1980’s, the resurgence of the strong shoulder and weirdly shaped silhouette is a revelation. For some of us who were there…. well, let’s just say we’d rather not revisit all things from the past. 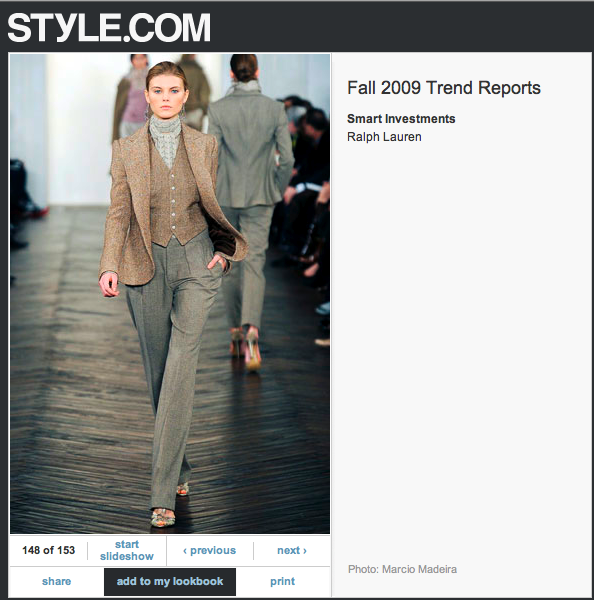 Buried deep within the usual silliness of the fashion scene, women will find that classic tailoring still exists. I urge you to do a little shopping this season. Find a houndstooth skirt, the perfect pantsuit or skirt and jacket, that dress. All the houses are rethinking classic. Even Versace falls into line with Celine, Ralph Lauren, and the always elegant Carolina Herrera. When the trends are going your way, it’s time to embrace them. This entry was posted in Elegantology and tagged AMC, Carolina Herrera, Celine, Donna Karen, Mad Men, Quintessential Style Magazine, Ralph Lauren, Style.com, Versace. Bookmark the permalink. My only fear regarding the popularity of Mad Men is that designers will use it to push for extremely narrow lapels, ties, etc. I’ve already noticed that some retailers, Lands End for one, are offering shirts that have been designed for newer, narrower ties. I’ve managed to live through the fat tie knot fad, and I’m sure I’ll be able to survive this one, but I have to wonder, who still really focuses on the traditional, non – trend obsessed male? 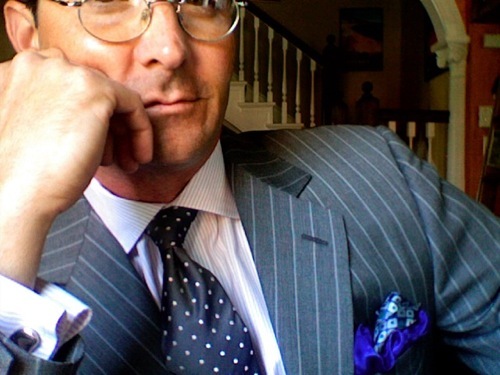 Nick, classic men’s stores like Chipp, Brooks Brothers (although they slide a little), Ben Silver, J. Press or MTM/Bespoke clothiers. In the 80’s, I used to wear those shorter collared button downs that were my father’s in the 50’s and 60’s with my vintage and “new” slim ties and 60’s sack suits. Loved them. But the fuller roll still holds up under the suit collar better without a tie. Is Q still be published? I can’t find a recent copy. Some of my fondest memories of when I first came to NY and begged my parents to buy me a black coat which I swore I would wear forever. I think classics get tweaked – the shoulders, the lapels, the cut and suddenly what was once classic, has a certain nuance that makes you want the next new classic. I of course love classics with a twist, I love Paul Smith – his designs have that extra touch, the striped lining, or a special button. Great shots…love Autumn and the Fall Fashions and tastes of Fall! Hello Ms. Bart and welcome. I hope so. I got a copy of the summer issue a couple of months ago. But I can’t seem to find them on the web now. Indeed Mrs. PvE. They may be tweaked, but they remain classics. Don’t buy anything too extreme and you’re set for the life of the garment. The subtle nuances of Paul Smith are just icing on the cake — delicious design choices and lots of fun. Good news at last for grown-ups. I am so tired of the slip dress, cardigan and flipflops look for women, and the cut-offs or cargo pants with flipflops ! for men. E, are the dots on your tie pink or white? Either way, the outfit is wonderful. Do yourself a favor and pick up the Sept VOGUE, if Mrs. E hasn’t already!! There is a gorgeous editorial on the “Return of the Forties.” To some extent, this happens most every Fall lately. (I blame Dita for this!) However, the layout in this issue is really exceptional and so are the clothes. Women look like women again, they are even showing longer nails, thank goodness. I am so tired of the “utilitarian” nail for women. It’s really a nice change of pace. I am remiss in keeping up, let alone commenting. 1 – I made a poor man’s version of risotto this evening and look forward to trying Mrs. E’s. Nevertheless, my creation fed and satisfied, but now my mouth is watering for what you and the Mrs. offered. I love it when passages, books, people find us. Your two most recent posts did just that for me this cool, windy evening during our UK stay. Jay, thanks and how kind. White. Ami, I’m the magazine reader in the family and I will. Hoorah for the return to elegance! Parthenope, ain’t it the truth! It’s been too long since I stopped in. I see you can still make an elegant suit even more elegant, and your essay on women’s style shows me that your range has been expanding beyond when last I had a chance to visit. REALLY well done all round here – I need to visit more often. I know how hard it is to keep up a blog – glad to see all’s still well in this corner of the blog-o-sphere! Hello DCL. You’re always welcome. Thank you for the compliment. I’m trying. And the blogosphere is so large, there is too much good stuff to see. I can get lost, too.